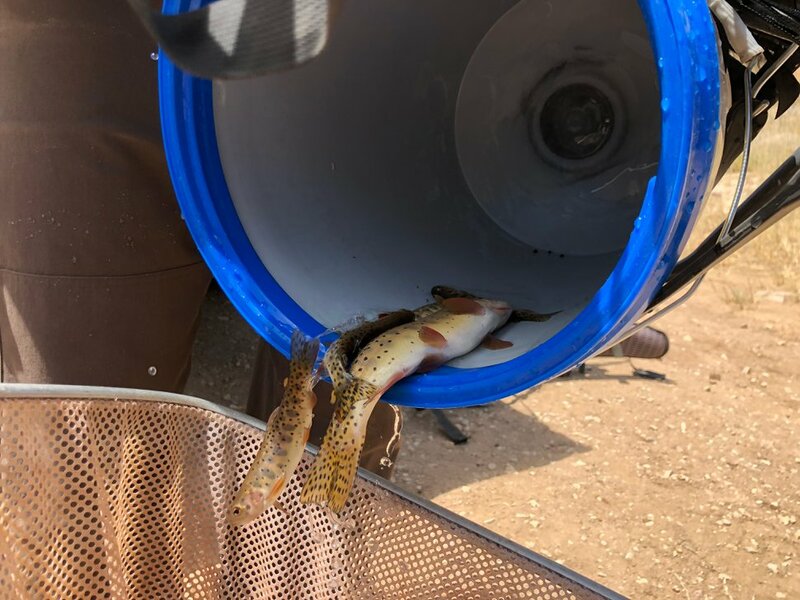 (Photo courtesy of Utah Division of Wildlife Resources) Utah fisheries managers extracted 400 native cutthroat trout on Monday from a southern Utah stream threatened by the West Valley Fire in the Pine Valley Mountains. These fish will be held at state hatchery for a year or two while the South Ash Creek watershed recovers. Bracing for the complete loss of a restored native fishery in the path of the now-slowing West Valley Fire, wildlife officials Monday rescued 400 Bonneville cutthroat trout from a stream in southern Utah’s Pine Valley Mountains. These fish will be held at a Wayne County hatchery for eventual return to the South Fork of Ash Creek, which is expected to live up to its name should the watershed burn over, according to Richard Hepworth, a fisheries biologist with the Division of Wildlife Resources. DWR predicts sediments unleashed from the blaze will flush into the stream and asphyxiate thousands of fish. The waterway could be uninhabitable for two years, potentially neutralizing the agency’s efforts to establish a safe haven for native cutthroat in these waters north of Toquerville in Washington County. An abandoned campfire sparked the West Valley Fire June 27 in designated wilderness on the Pine Valley Mountains’ west slope. The flames quickly enveloped timberlands within Dixie National Forest. By last Friday, the fire crested the range and began working down the east side. Its progress has largely stalled, and the blaze is not expected to grow much beyond the 12,000 acres within the current burn perimeter, which was 55 percent contained by Tuesday, according to Forest Service spokeswoman Sierra Hellstrom. The uncontained portions are in cliff areas that are unsafe for firefighters, so it may be several days before containment is achieved. Cooler weather has helped slow the fire, but so has the burn scar from the 2009 Mill Flat Fire, where fuels have been depleted. (Photo courtesy of Utah Division of Wildlife Resources.) Utah fisheries managers extracted 400 native cutthroat trout on Monday from a southern Utah stream threatened by the West Valley Fire in the Pine Valley Mountains. These fish will be held at state hatchery for a year or two while the South Ash Creek watershed recovers. One minor eye injury was reported among the firefighters, and no structures were lost — other than a historic cabin few people knew about. About 290 firefighters remained on scene. The burn area will remain under a closure order through Dec. 31. Despite the West Valley Fire’s slow progress, DWR is taking no chances with the cutthroat in Ash Creek. Their genetics, which are specifically suited for streams in the Pine Valley Mountains, are critical to the survival of the Bonneville, one of Utah’s four cutthroat subspecies. The state’s only native trout, cutthroats have been under pressure from rainbow, brook, brown and other introduced species, which have displaced cutthroat trout from their native waters. 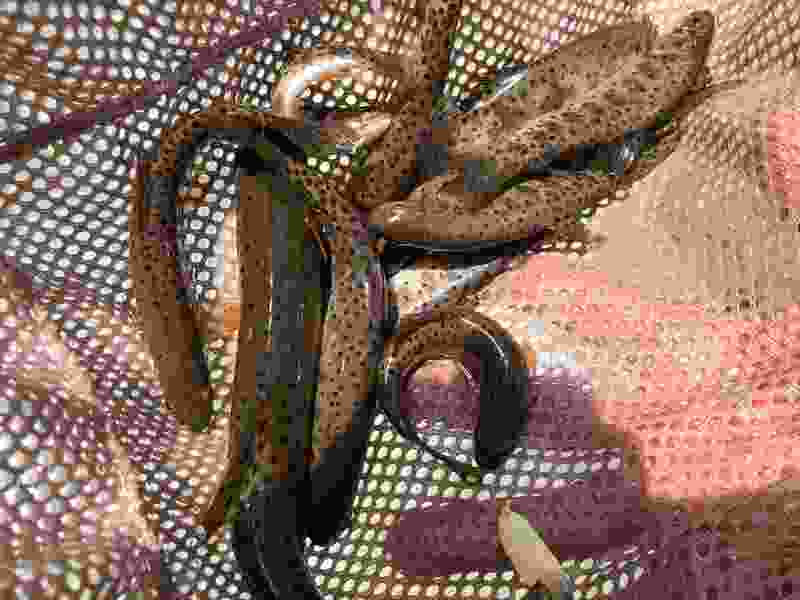 To forestall a federal endangered listing, Utah fisheries managers have rid many streams of all fish using poisons that target gill-breathing creatures, then restocked them with cutthroat and other native fish. Coincidentally, DWR will conduct the final phase of a stream-poisoning project on the Dixie National Forest’s Mammoth Creek drainage later this month. Castle Creek on Cedar Mountain will be closed to the public starting July 31 while crews apply the piscicide rotenone to kill non-native brook trout, which will eventually be replaced with cutthroat. Ash Creek’s South Fork was the scene of similar project several years ago. Using a backpack-mounted shocking device, crews delivered electric charges to Ash Creek Monday, then gathered the stunned fish into buckets. The rescued cutthroat were taken to a state fish hatchery in Loa, where they will remain until the stream is safe for supporting fish. Last year’s Brian Head Fire took a heavy toll on trout, eliminating them from about 100 miles of stream in Dixie National Forest, including all the tributaries into Panguitch Lake, according to Hepworth. DWR intends to repopulate some of these fishless streams, starting with Parowan Creek, exclusively with cutthroat trout. (Brian Maffly | The Salt Lake Tribune) The Brian Head fire has left steep slopes vulnerable to severe erosion, including along the Spruce Trail near Bowery Creek, seen here on Sept. 8, 2017. Sediments from the burn areas wiped out fish in 100 miles of streams, including Panguitch Lake's tributaries. 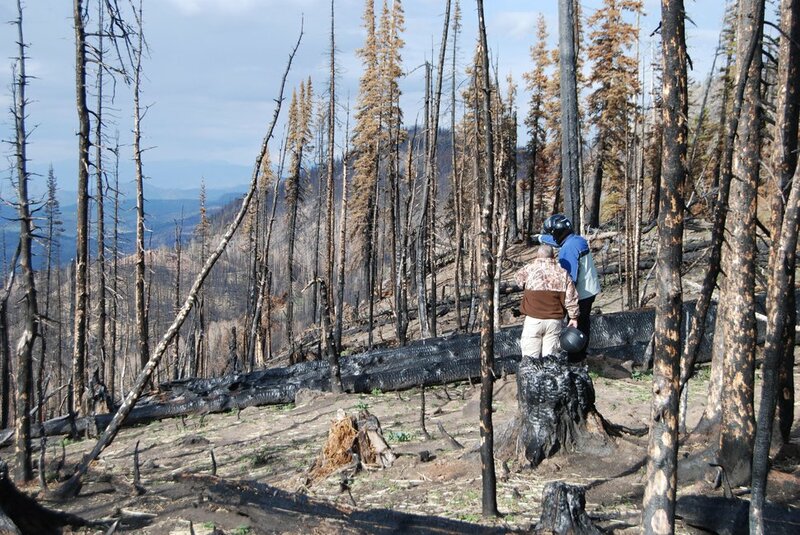 The agency pulled off a successful cutthroat restoration on streams wiped out in the 2010 Twitchell Canyon Fire, which burned 45,000 acres in Fishlake National Forest.